Well, the dress fit the fabric, but it didn't fit me. Its shape and my shape don't get along so well. There are a lot of catty comments and rolled eyes when they get together. Sigh. Which reminds me that even if you are just longing to use some gorgeous fabric, it doesn't pay to jump at the first halfway semi-suitable project that comes along. 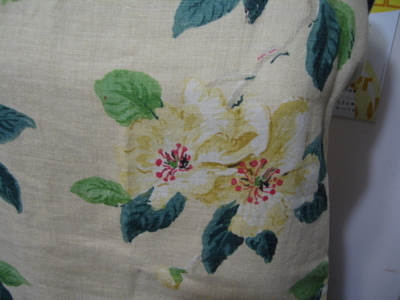 Here's a closeup of the fabric — can't you see why I wanted to use it? I hate to cut up a dress to make something other than another dress (or skirt, in a pinch) out of it. So, yes, I know this would make a lovely pillow/handbag/matched set of antimacassars, but I can't bring myself to do it. If you want to, more power to you! Hmm. It looks like I should have pressed this again before I took photos! Well, it is linen, after all — so call this 'truth in advertising': it will wrinkle! Jane Tise pattern aka "best midriff ever"
Nora sent me this, under the subject line "one more midriff for you." I love the email I get from MilitaryHumveeAuction readers; the subject line never reads "URGENT PROBLEM!!!" or "REPORT DUE TODAY." In fact, there's a remarkable lack of shout-case all around, for which I thank you. Had any of you heard of Jane Tise before? I hadn't. But a couple quick Googles turned up that she was one of the founders of Esprit, back in the day! And that Esprit was called The Plain Jane Dress Company first, which, while cute and having that fakey-homespun feel of the late sixties/early seventies, probably didn't have the marketing ooomph that "Esprit de Corp" had. Or the little inherent pun. And speaking of marketing, how did I never notice the Butterick tagline "The Fashion One" on their patterns before? I am afraid it doesn't speak to me (of course, thirty years after the fact, what marketing catchphrase would?). It seems slightly off. "Which pattern company do you prefer?" "Oh, you know, Butterick — the fashion one." Because all the other pattern companies are strictly utilitarian, of course. Only coveralls and aprons to be found there, my friend! Back to the pattern — this is up on eBay right now, but work fast, because the auction expires in less than 14 hours. Tick-tock! We interrupt this dress blog to talk about shoes. The only problem with the is that none of my closetful of carefully-sought-after full-skirt-friendly round-toed kitten-heeled ankle-strap girlie pumps look right with it. 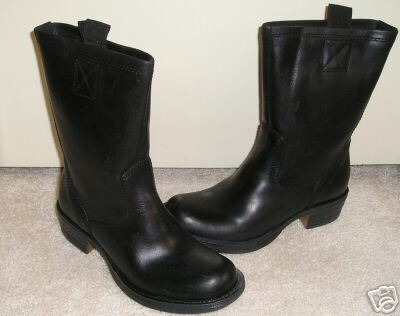 I have a couple pairs with sturdier, stacked heels that look okay, but they're not very summery. What the Duro really needs is wedges. So I've been on a shoe hunt. I like ankle-straps (you can walk faster in ankle straps) and heels lower than 3 inches, which are surprisingly hard to find. And NO pointy toes! 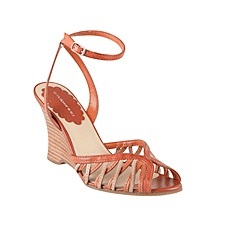 (I'm linking to the only pair of these left online, in "Tomato" in a size 9 1/2). What shoes would you wear with a Duro-style dress? Miss Maya sent in this photo from Seattle. Holy butterflies, Batman! I have been thinking about this dress for a couple of days, trying to figure out if there would ever be a situation where I was called upon to represent a marabou-topped butterfly, and sadly, I can't think of any. The only thing I came up with that was even close was checking if there was ever a butterfly-themed superhero who needed to attend a ball at Wayne Manor, but the let me down. No butterfly-themed superheroes (or villains). There's a , and a , but no Butterfly. Okay, I admit it, butterflies aren't very tough, and I'm sure a butterfly hero's secret weakness would be GIANT LIGHT BULBS, or possibly small boys with nets, and if you brushed her wings she'd fall out of the sky, but still. You'd think that if there was , there'd be some kind of butterfly being. This idea somehow really appeals to me, except I think that the monarch detailing and the marabou take it so far over the top that you'd need directions and a bus pass to get back. Now, if it lost the marabou (maybe a matte satin ruffle, instead, if you needed something at the top of the bust?) and was made in a heavy greeny-gray with tone-on-tone flocking and beading to look like a moth's wings, and not a butterfly's? That would be something. Maybe something would wear. Or . NOTE: enough folks have emailed me about this dress that I have to make these disclaimers. I DID NOT MAKE THIS DRESS. More to the point, I CANNOT SELL YOU THIS DRESS. Try this site: . Good luck! Christie's is auctioning the "Breakfast at Tiffany's" dress. But this picture of it is the dumbest thing I've seen for some time. Why, for the love of all that's holy, would you shoehorn a random employee into this iconic dress, when you could simply pay a few bucks and license one of the official pictures from the movie, showing it in all its glory? Because here the damn thing looks like a dishrag. Not to mention that often the people who buy these things are not fashion collectors (who want the dress as a Dress) but hagiographists who want something that touched a notable person. The idea of some entry-level employee wearing it impinges upon that aura, I would guess. Not to mention (as , who sent me this link, pointed out) that shoving a real person into this dress increases the likelihood of accidental rips, tears, and stains, possibly lowering the value. Feh. Some people have no sense. 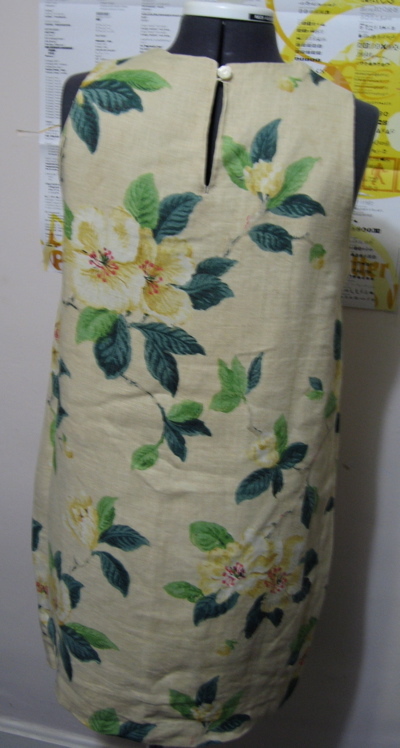 This is their "farm dress", and, although I really would prefer it with sleeves, I like the bands set on the bias. Am I going to "steal" that technique, now that I've been reminded of it? You bet. Manifesto: also has a section of their site called "The World of Pants," which made me laugh and click — always a good sign. And the pants there were pretty darn cute (yes, I can't believe I'm saying this, either). Maybe I'm just a sucker for tuxedo piping. Isn't this adorable? Like all right-thinking people, I love notecards. LOVE them. I have an enormous box of them. (And I just bought some fifties-fabric themed ones from the V&A …) I probably spend more time deciding which ones to use than I do writing the actual notes. It must be the midriff band.